It’s incredibly important (especially as a Support) that you ward around objectives while your team tries to take them. These wards can save your team’s life, so you need to know where and when to ward. In this Picklepants Mobalytics guide, we will provide you with a range of information that can help you out while sieging towers and objectives around the map. The wingy sticks will provide you with information that you can interpret and use to your advantage. The information differs from each ward, and you should try and keep an eye on the map to see what every ward is telling you. Before we start talking about how to ward and where, you need to understand what you can achieve by having good warding around the tower or monster you want to take. One of the main objectives of a ward is to spot and see if there are any enemy champions coming towards your team. If you see that an enemy champion is coming through one of your wards, your team will be able to decide what to do about it. Being given this information will allow your team to do one of three things. Turn and fight the enemy. If you decide to turn around, you may be able to kill the enemy. This will give your team even more pressure on the objective as you can quickly return to taking the tower after you’ve killed your victim. This is only possible if the enemy is squishy or is out of position. It may be hard to kill somebody if they are far away. If you do decide to turn and fight the flanking enemy, make sure your team is on the same page. However, if the enemy who is trying to flank is low-threat, then you should be able to continue taking the objective. If your team decides that the champion is no threat to your team, then leaving them to the side is fine as they will be unable to engage on your team or do anything. Alternatively, if the person who is flanking your team is fed or has the potential to interrupt your siege, then you may need to back off. Risking your team’s life for one objective is not necessarily worth it- especially if a major objective is up. So, if you cannot turn and fight the enemy, you should just back off and retreat. If you get caught out, your team may lose major objectives such as Baron or Dragon as well as a couple towers. In global conflict, scouts or pathfinder go in front of the infantry to scout and tell their comrades what is happening ahead and in League, vision and warding are quite similar in comparison. Warding while pushing in enemy territory is a must as wards can often scout and give your allies information. Whenever you decide to take an objective you need to ward. The line represents which way you’re pushing. The versatility of each ward differs depending on where it’s placed. If it’s not placed next to a wall or tower, then it will cover a wider distance. You can use this to your advantage by placing wards more towards the middle of the bush rather than close to a wall. Deeper wards give your team more time to react and this can mean life or death. Try your hardest to place a mixture of wards behind, next to and in front of your team. 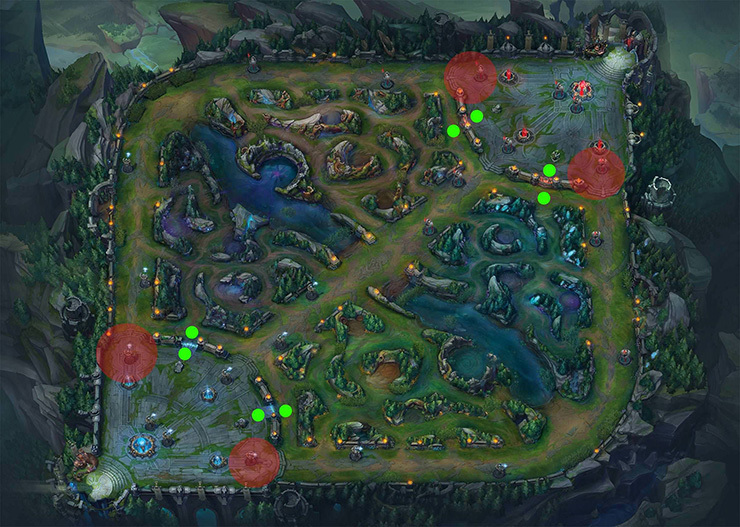 Sections of the map are easier to ward than others, this is especially true for the side which houses the Blue buff. Usually, there are less places to ward on this side. While sieging the inhibitor towers, you need to have more offensive wards to scout the enemy. This is because you’re knocking at the enemies door and the possibility of flanks is less-so. The red represents tower range. You need to beware of the tower and its range to prevent you wards from easily being destroyed by the enemy. Placing them in the middle (nearby outside of range) will allow them to survive for longer. Do not forget to ward your flanks, whilst the picture lacks these wards- you still might get flanked by the enemy. To prevent this, ward inside the enemies base and have a control ward inside the enemy Jungle. If you’re frequently sieging, you can prevent enemies vision by placing a Control ward to the back of gates. This will prevent vision and allow the Control Ward to stay alive as it’s out of range. REMEMBER: All of the wards shown are situational. Try your best to place wards that give your team information. Monsters such as Baron and Dragon also need good vision to take efficiently. If you give your team vision around the object you will allow your team to take it with ease and allow your team to know if the enemy is taking it. Warding slightly varies for both monsters even though they are exactly the same (the pits are identical because the map is flipped.) You should know where to ward for each side of the map and for each team. It’s important that you ward before you take the objective and whilst you’re doing it. If you ward beforehand, then you will know if the enemy are coming to stop you. This will allow your team to react. Baron was recently changed and made stronger, much much stronger. Strong enough to make any sneak Barons much harder to take. Remember to always place a Control Ward in the pit. 50/50 Barons are very risky and teams will often throw at Baron. If the enemy places a ward in the pit- avoid auto attacking it. This is because it will be blinded by your Control Ward and once auto attacked by mistake, it can show the Baron’s health. This may give the enemy an opportunity to steal it. As a Support, be prepared to use your hard CC to prevent the enemy from stealing it. A good Howling Gale from Janna can prevent enemies from getting over the pit. You can use vision to your advantage here by holding on to your ability until the right moment. Every Dragon is important, don’t let people tell you otherwise. Why would you want the enemy to take an Inferno for free? Do not destroy any wards if they’re placed in the Dragon pit. If you have a Control Ward placed, this will naturally blind any wards inside and attacking the ward, will show you and your team as well as the Dragon’s health. This may be giving the enemy an opportunity to steal it. If you do not have a Control Ward placed and you know the Dragon is warded, you may have to bring the Dragon out of the pit in order to prevent steals. This is a very good place to ward at the Baron and Dragon – the area is often overlooked as it is slightly out of the way of the “usual” sweeping pattern that most players take. If the ward is not spotted, your team will be able to know if the enemy is doing it as you will be able to see the enemy champions. Note that the ward does not show the Monsters health points. Even though SKT anticipates the ward, the placement has become more popular thanks to this very clip. If you can place a ward in this area (at both pits) you will be able to scout if the enemy is doing them. Yes we know SKT beat the system with this one, but not every team is going to be this smart when taking the objective, so you can use this ward to your advantage. When warding for your team, you need to keep these things in mind. If you forget about this information whilst warding, then you may be putting yourself and your team in danger. Before going to ward, you want to make sure that you’re going to be safe and that you will not die while you’re away from your team. In the later stages of the game, death timers can be quite long and if you die, you may be putting your team at a disadvantage where the enemy can brute force objectives and towers. So before you go to ward, it is important that you do not get caught out and die. If you cannot ward safely, request assistance from your team. Otherwise, do not go and ward alone. If you can’t ward, don’t. One of the most important things to remember is to not waste your wards before, or after your siege an objective. Vision is incredibly important, and you should not waste your wards in useless areas. This is because you may be able to get more objectives after you’ve taken the intended one. If you have no wards on you (because you’ve wasted them) you may be in the dark when trying to get the next objective. For example, when sieging a tier 2 tower, you may be able to take the inhibitor tower as well and you can ward around the side to protect your team. In this guide, we’ve listed and shown some places that you can ward which you can use and build from to improve your warding. Another thing to keep in mind is that you shouldn’t be aiming for any amount of wards being placed or any Mobalytics warding score. I’ve had countless players ask me “what warding score should I aim for at any given time?” The question is not possible to answer without context. A good Support wards when they need to and in appropriate places. Like stated throughout this guide, it’s important to only place wards in good locations where they can provide you with information. In this guide, we’ve focused more on warding with your item, but you can also use Control Wards too. It’s a good idea to hold one or two of these little monsters in your inventory to destroy and deny enemy vision. These items come in handy especially around objectives such as Baron and Dragon so make sure that you make good use of them. Thanks for reading! As always, you can find Picklepants in our Discord if you have any questions, and feel free to leave us a comment or suggestion below.